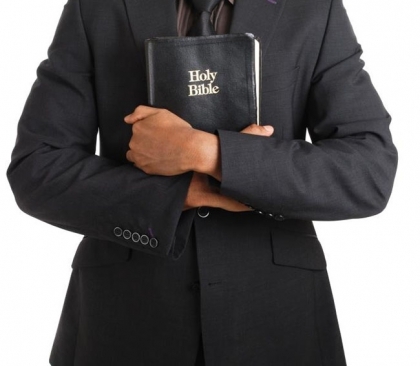 A self-acclaimed pastor in Imo State, Nigeria, Delight Arinze Okorie, has been arrested by the State Police Command for allegedly extorting money and duping unsuspecting victims of huge sums of money using fake prophecies and miracles. According to the police, the 45-year-old Okorie who the Founder and General Overseer of Watered Ground Ministries, was said to have deceived, robbed and attempted to kill one Chioma Oleka, at Atta in Ihennasa, Njaba Local Government Area of the state, by falsely claiming that she was possessed with a marine spirit. The Commissioner of Police in the state, Taiwo Lakanu, while parading the suspect, said he had lured Oleka to the Nwangele River where he was to administer special deliverance prayer for her. The woman, according to CP Lakanu, had driven to the rendezvous in her Lexus SUV Jeep, not knowing the Okorie actually wanted to kill her and dispossess her of the car and other valuables. “Before this thing happened, I had been attending Watered Ground Ministry, the church headed by Pastor Okorie. He always prophesied in the church and one day, he said that I had a mermaid (marine or mammywater) spirit. He said I had to go for special deliverance prayer not knowing that he wanted to rob and murder me. During the prayer session, he suddenly pushed me from the top of the bridge into the river. He gave me machete cuts thinking that I would die. But a police patrol team rescued me, took me to the hospital. Also Read: "Gruesome Murder: Pastor hacks banker wife to death in Imo [Graphic Photo]"
“I have been in pastoral ministry for over 10 years. When some of my members or the friends they bring, come to tell me about their problems, I always give them fake prophecies. If I discover that they have money, I use the opportunity to rob them by setting them up with the fake prophecies. On how the incident of Oleka came about, as we were praying on the bridge, I went to the back of the vehicle and picked up a machete. I gave her several cuts all over her body with the intention to kill her. “It is God'ws ork that the woman did not die. Rather, she pretended to have died. After the operation, thinking the victim had dies, Okorie and his gang members continued their operations for several months. Oleka began to recover from the attack while still in the hospital, so when she was strong enough to talk with police detectives investigating the case, she recounted what happened and gave the police the registration number of the car. For a while, the police kept Okorie under surveillance and then moved in to arrest him. With information obtained from Okorie and the other members of his gang, the police recovered the Lexus SUV as well as the arms and ammunition of the gang.